When the thought of the dirtiest matches in World Cup history comes to mind, attention may be turned to the England vs Colombia game in 2018, Portugal vs Brazil in 1966 that saw Pelé kicked into International retirement (which was ultimately revoked), or Portugal vs Holland in 2006. The latter set a record for the number of red and yellow cards at the World Cup, in all, four reds and sixteen yellows. Portugal ran-out 1-0 winners but the reputations of both nations were tarnished following the violence and volume of cards handed out on the field. Valentin Ivanov, the referee, was lucky that on this day he could dish out cards to the culprits and dismiss the worst offenders. One benefit of modern football is that there is a staggered punishment for foul play, something that was not in place in 1962. The 1962 World Cup was its seventh instalment and hosted across Chile. From the 56 sides that competed, 16 qualified for the finals. Brazil ultimately ran out as winners, defending their crown from 1958, as they defeated Czechoslovakia 3-1 in the final in Santiago. The Brazilian feat of back-to-back victories has not been repeated since. The hosts finished third in the tournament meaning that all Chileans enjoyed a memorable summer. That summer was memorable for many different reasons, not just for pride in the team’s performance but for the way they overcame adversity. The build up to the World Cup was not easy for the host nation. In May 1960, as the preparations were well under way, Chile suffered the largest earthquake ever recorded, which caused enormous damage to the national infrastructure. The earthquake measured a magnitude of 9.5 and lasted for ten minutes, destroying thousands of homes and disrupting the whole nation. In the face of this, Carlos Dittborn, the president of the World Cup Organisation Committee for Chile, coined the phrase; “Because we don’t have anything, we will do everything in our power to rebuild“. Stadia and other infrastructure were rebuilt at record speeds and the tournament occurred on schedule with no major organisational flaws. Dittborn did not live to see the success of his efforts, however, as he sadly passed away one month before the start of the tournament. It was a huge credit to the fighting spirit of the Chilean people and the World Cup Organisation Committee, that the World Cup even took place. Despite many of the stadiums only having small capacities, it was more than acceptable for the low number of supporters who travelled to Chile for the tournament. This was because of a lack of technology, opportunity and finances for supporters across the globe to travel to Chile for the 1962 World Cup Finals. The Chilean President Jorge Alessandri gave an uninspiring speech before the commencement of the first match, between Chile and Switzerland. The World Cup had galvanised the Chilean people following the earthquake and helped turn a tragedy into a strong feeling of national pride. However, President Alessandri was not as captivated by the tournament. This is perhaps best demonstrated by him leaving before the end of the opening game. Some members of his government came out and said Alessandri was as ‘footballised’, a popular phrase to describe the fanatical fever the swept across Chile at the time, as the rest of the nation but he was just too busy to properly display this. No doubt an excuse that was easy to see through by many Chileans. The tournament itself hosted several of the 1960’s footballing superstars underperforming for various reasons. The great Brazilian Pelé was injured in just the second group game against Czechoslovakia. The ‘Black Spider’, USSR’s and arguably the world’s best goalkeeper, Lev Yashin, was in poor form as his team were knocked out by the hosts in the quarter-final. Pelé’s absence paved the way for youngsters Amarildo and Garrincha to shine for Brazil. The heroic performances of the unfancied host nation Chile, with a squad of relatively unknown players, inspired many Chileans. Despite this, the competition was marred by constant violence on the field. This poisonous atmosphere was best depicted in the first-round match as the hosts defeated Italy 2-0. The game later became known as the ‘Battle of Santiago’. The tension was building between the two nations prior to kick-off. Two Italian journalists had written unflattering articles about the host country and its capital city. They described Santiago as a “proudly backwards and poverty-stricken dump full of prostitution and crime”, going on to say, “the phones don’t work, taxis are as rare as faithful husbands, a cable to Europe costs an arm and a leg and a letter takes five days to turn up”. As if this wasn’t enough, they went on to criticise the locals, describing them as being prone to “malnutrition, illiteracy, alcoholism and poverty”. This created a visceral hatred between the two nations before the match. The Chileans were rightly annoyed. They had gone through immense upset and turmoil to get the tournament up-and-running, but they were now being ridiculed by one of the nations they had worked so hard to impress. Before the game is analysed, it is important to note the procedure of removing players from the field of play in 1962. Red and yellow cards were not invented in time for this World Cup tournament. However, players could still be dismissed from the field. Cards give a referee more power and respect as warnings can be given out. At this point, players had less reason to listen to a referee as there was no middle ground, you were either on the pitch or not. The lack of warnings meant referees had less power and arguably less respect. This made refereeing in one of the most ill-tempered competitions in football history a lot harder than it would be today. 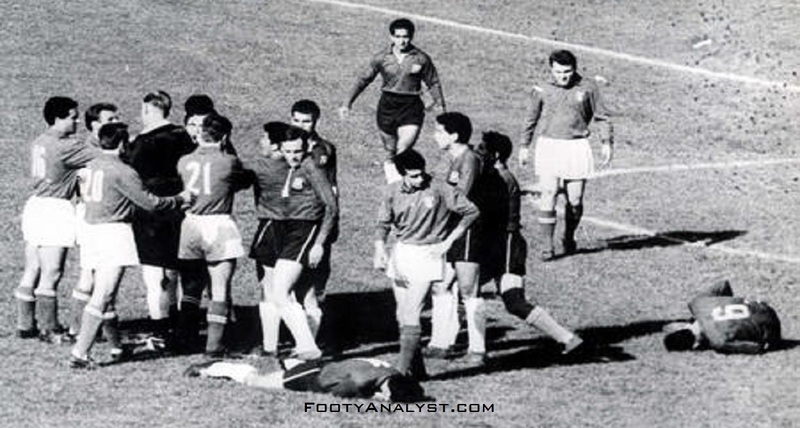 It was not just the Battle of Santiago that attracted attention for the on-field violence, the whole of the 1962 World Cup was marred by the deplorable behaviour in many games. There was a widespread conscious shift in strategy to a more defensive style for the tournament. This is evident as the average goals per game dropped to less than three for the first time in the competition’s history. This more negative game plan from many teams would, of course, be a direct influence on the drop in goals per match. However, it also led to increased frustration from players which, in turn, led to the frequent violence on the pitch. There are always likely to be less goals when the players are either injured or more interested in kicking each other than playing football. The Battle of Santiago was, unfortunately, one of many ill-mannered games. Much of the competition was affected by a negative atmosphere and aggressive behaviour between players on the field. There were four players sent off in the first eight games, as well as three broken legs and a fractured ankle. Argentina’s first game against Bulgaria consisted of 69 free-kicks. Yugoslavia were so appalled by their own player breaking the leg of a Russian, they suspended him for a year, although he wasn’t even dismissed during the game. There were countless examples of a desire not to be beaten conquering a desire to play good football. The bad blood on the pitch was partnered with critical journalism from the world’s media of the host nation. Following the negative press received from the Italians, Chile and the city of Santiago were already fired up for the game and it was only ever going to end badly. FIFA were anxious about the potential for violence in the match. The pre-selected Spanish referee was stripped of the game; Italy had complained about having a fellow Spanish-speaking official. In the hopes to calm bubbling tensions, an experienced (non-Spanish speaking) referee was drafted in. It was English referee Ken Aston who was selected to officiate for the game and he had a monumental task ahead of him. More punches than a boxing match and flying boots akin to a cavalry charge, it was far from sportsmanship and far from a game of football. BBC’s broadcast of the footage for the game, a couple of days later, was introduced with an iconic speech by David Coleman: “Good evening. The game you are about to see is the most stupid, appalling, disgusting and disgraceful exhibition of football in the history of the game. This is the first time these countries have met; we hope it will be the last. The national motto of Chile reads, ‘By Reason or By Force’. Today, the Chileans weren’t prepared to be reasonable, the Italians only used force, and the result was a disaster for the World Cup. If the World Cup is going to survive in its present form something has got to be done about teams that play like this. Indeed, after seeing the film tonight, you at home may well think that teams that play in this manner ought to be expelled immediately from the competition”. There was no moment that lit the blue touch paper in the game, other than the whistle for kick-off. The Chileans were kicking, barging and even spitting at the Italians from the off. It took little over ten seconds for the first foul and four minutes for the first dismissal. The Italians had soon begun to retaliate to the Chilean abuse, yet it was the Italians who were more strictly punished. Giorgio Ferrini was the first to face the wrath of Aston, however, he paid little attention. Aston sent Ferrini off from the field, but it took armed police and a ten-minute delay before he obeyed these orders. It was clear that the ball was not the focus of the players, they were more concentrated on landing the next blow on the opposition. Chilean Leonel Sánchez broke the nose of Humberto Maschio, before hitting Mario David who was then dismissed for swinging a leg back at him. The Italians certainly had ground to feel aggrieved by the decisions of Aston, but the referee was given a near impossible job. He was assisted by an Israeli and a Mexican linesman who not only struggled with a lack of experience, but with a fear of upsetting the baying home crowd. The game ultimately finished with a nine-man (from the 41st minute) Italian team running out as 2-0 losers to the Chileans, in front of over 66,000 in Santiago. Jaime Ramírez and Jorge Toro scored the goals that handed Chile the win, but the football will never be what this game is remembered for. The post-match discussion was, of course, focused on the violence but was mainly centred on the failure of the officials to dismiss Sánchez for breaking an Italian nose. Aston discussed the matter after the game, describing how he missed the whole incident, “I had my back to the incident at the time. If the referee or linesman sees nothing, nothing can be done. I’m sure the linesman did see it, but he refused to tell me. I was stuck with a Mexican and a little American. They weren’t very good, so it became almost me against the 22 players. I expected a difficult match, but not an impossible one. I just had to do the best I could. It did cross my mind to abandon the match, but I couldn’t be responsible for the safety of the Italian players if I did. I thought that then and I still think it now”. Leo Goldstein, the American-Israeli linesman who Aston described as a ‘little American’, was an inexperienced official. It was believed his selection was a publicity stunt by FIFA. Goldstein was a Holocaust survivor who was approached to be an official for the tournament, despite a huge lack of football practice and knowledge. Regardless of the lack of experience from Aston’s assisting officials, the Italians left the field feeling aggrieved. The backlash that Aston received for the refereeing was immense, especially in Italy. Mario David later recalled a journalist calling Aston ‘an unmentionable English vermin’ and added that “I totally agree with him”. After a scathing criticism from honorary president of the German FA, Peco Bauwens, who said “I have never seen an English referee so weak”, Aston claimed that he could have taken the easy route out and abandoned the game but he had self-respect. The disgraceful game was responsible for creating a void between the two nations, outside of football as well. The Italians surrounded their training ground with armed police and the few Italian fans that travelled were banned from many bars and restaurants. Back in Italy, the army was deployed to protect the Chilean consulate. The tournament’s feisty and vicious nature continued but never lived up to the famous Battle of Santiago. Chile went on to defeat the European champions USSR to earn a place in the semi-finals. There they faced an English-conquering Brazilian team. The other side of the draw saw Yugoslavia and Czechoslovakia meet after defeating West Germany and Hungary respectively. Czechoslovakia were the first team to book their place in the final. Nearly 77,000 watched Brazil end Chilean dreams, although they did go on to secure a third-place finish. Santiago hosted the final and despite an early Czechoslovakia strike, goals from Amarildo, Zito and Vavá won the 1962 World Cup Final. Brazil had secured a successful defence of the World Cup for the second time in the history of the competition. All of this, despite the absence of Pelé. Brazil were champions and the Battle of Santiago was written into the annals of football history for all the wrong reasons, however, there was also another lasting legacy of the tournament. Ken Aston may have gained a lot of criticism from Italy, but he was soon to have an epiphany that was to reshape the face of football officiating. The former teacher and lieutenant-colonel in the Second World War, enjoyed a position of power and authority and this applied to refereeing too. His career was long and successful, and he was on top of the refereeing ladder when he retired in 1963 after the FA Cup Final. Post retirement, Aston was a part of the FIFA Referees’ Committee eventually chairing the committee, following his successful role as head of refereeing in the 1966 World Cup. On-field violence was a major talking point in 1966, much like in 1962, and Aston was keen to stamp down on this. One day, whilst Aston was driving his car he came to a traffic light and the ‘Eureka moment’ came to him. Whilst sitting at a red light he came up with the idea of red and yellow cards. He returned home, thought about his idea and decided to present it to FIFA. Discussing the moment, Aston said, “As I drove down Kensington High Street, the traffic light turned red. I thought, ‘Yellow, take it easy; red, stop, you’re off’”. The 1970 World Cup in Mexico saw the introduction of cards and an end to referees pointing players off the pitch to dismiss them. It provided the referees with more authority and protection, they could now officiate a game with a lot more power. Aston was the architect of this idea and it marked his momentous influence on football refereeing. He was awarded an MBE in 1997 for his services to football in England, America and the game as a whole. He summed up football: “The game should be a two-act play with 22 players on stage and the referee as director. There is no script, no plot, you don’t know the ending, but the idea is to provide enjoyment”. His greatest legacy may have been the invention of red and yellow cards, but Aston certainly would have appreciated this system in 1962 and may well have wished he had conjured up the idea sooner.